In the wake of the face-off between the federal probe agency CBI and the West Bengal government on Sunday, the Supreme Court agrees to consider on Tuesday morning the CBI's plea for surrender of evidence and contempt against the local police. 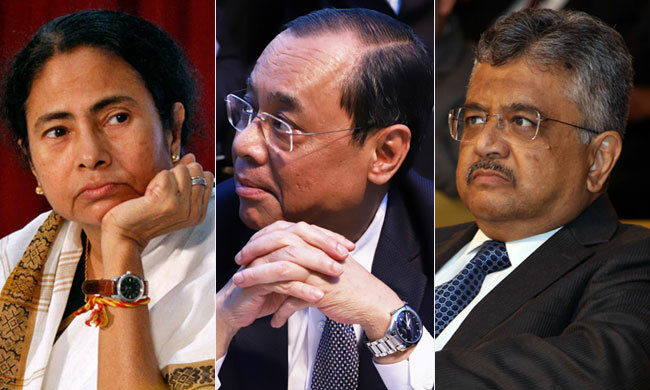 At the threshold, Stalling Solicitor General Tushar Mehta's attempt to make the first 'mention', Chief Justice Ranjan Gogoi had stated, "Generally, the SG stands first. But today he shall come last"
Urging that the matter may urgently be heard at 2 PM on Monday itself, the Solicitor General termed the situation as "extraordinary", advancing that the CBI officials were taken into custody unlawfully at the instance of the state police. He also voiced his apprehension regarding the destruction of material evidence. "We have two prayers...first, the surrender of evidence by the police chief. Despite repeated notices, he refused to show up...Second, contempt against the police officers who sat on a Dharna with the political leaders", submitted the SG. "We read the applications that you filed this morning. In fact, this is why we were a little late today. But there is nothing in it regarding the destruction of evidence...", observed Chief Justice Gogoi. Listing the applications for 10:30 AM on Tuesday, he allowed the SG to bring on record material to support his claim in the course of the day. "If the Police Commissioner or anyone else is even thinking about destroying any evidence, we will come down so heavily that they will regret it", assured the Chief Justice.